I just got my braces on yesterday! They hurt like crap! They are purple just like my cast. When they were putting them on they had this cheek pincher thingy and it was pulling my lips and cheeks out of the way. It was on for like 20mins when it was really supposed to be on for like 10 mins. UGH. my mom took a pic of me on her disposable camera. cant wait to see what that looks like! So Cassie put a link to this so maybe half of her friends will look at this. So I thought I might please you all with the tale of my arm. So there I was. Sittin' in the house on the computer. Lindsay came and said, "Hannah, come jump on the tramp! Shawn and Cameron are out there!" So what the heck? I'll go. I go out there. We jump for a little bit. Then they're like, "Who wants to get popped?" Normally, I am terrified to even be on a trampoline with Shawn. He is 34 and he's merciless. Well, I don't know what got into my head but somehow I thought I wouldn't get hurt. So, I do it. Nothing happens. Then Porter went. Then they're like, "All right. Hannah, do it again." I sit down with my arms down, bracing myself. My feet were turned to one side and I was leaning on my left arm. Shawn and Cameron warned me. They said, "Hannah, sit indian style!" A thought came into my head of me flying 20 feet into the air. I said, "No way." "One . . .two . . . What . . .was that??? "Oooooooooow!" I screamed. I looked down. And my arm looked like Harry Potter's in The Chamber of Secrets when he has no bones. Except I had a bone . . . and it was sticking up under my skin. After that I started screaming. "Cameron! Go get Dad . . . I think she broke her arm." My dad comes out, "Yep. It's broken," he said very matter-of-factly, no fear in his voice. He carried me in the house as I was moaning and groaning. He laid me on the counter. And then I was convulsing and my head wouldn't stop going side to side. Cameron later described me as sleepy delirious. I really was tired. I just wanted to go to sleep. I was probably in shock. My dad and brother made me a splint out of a spatula and a cut out piece of cardboard. Don't forget the bandana sling. Mom, Cassie, Tracie, and Nat were gone shopping and picking up a boutineire for prom. They came home and there I was on the counter. I don't know why, but when my mom walked in I just wanted to cry. So I did. Darren carried me out to the car as I cried. "Hannah, it's going to be ok," he reassured me. They took me to one Urgent Care but it was closed. So we had to go to another one. In the waiting room, my arm was throbbing. I ended up with a sling, an ace bandage, and some Ibuprofen. I STILL got in my bridesmaid outfit and made it to the reception fashionably late. By the time I got there, the whole reception knew. I had TONS of people coming up to me and asking about it. Two days later I got my arm set. It hurt like heck. Two large men grabbed my bare arm with both of their hands and squeezed as hard as they could. I felt my bone move back. They didn't even give me a painkiller!!! I wanted to cry, but I gritted my teeth and held it in. So that's the story. 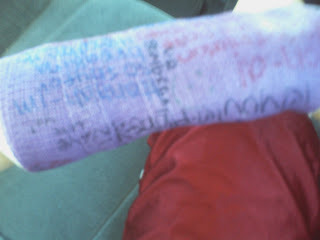 Now I have a purple cast pictured above. i just found out that my dance recital is a week later than girls camp!!!!!! so now i dont have to decide! 1. i broke my arm on justins wedding...typical. 3. my dance recital is during girls camp so im conflicted on either doing the recital for 1 hour or spending 4 days in camp lomia. i realllly want to go girls camp, but ive been working hard on my dance. i dont know what to do!!! !